Sarla is an enterprising person who brings a clear level of trust and professionalism on every project she works on. She has an expertise in recruiting, sourcing, and executive search. 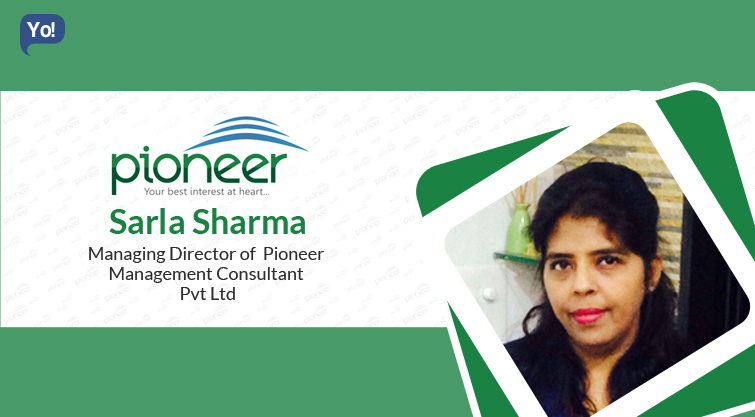 For the last two decades, she has been running Pioneer management consultant pvt. Ltd. Established in 1995, the firm specializes in manufacturing segment manpower sourcing consultancy. It has made a name for itself in Recruitment Industry with over 3+ Lakhs active candidates’ database & Experienced Recruitment Team. They are committed to provide clients the right solution for their recruitment needs, so they spend less time in recruitment & focus on their core business. Finding a pace that keeps the business humming without grinding down the owner is a challenge that comes early & often in the evolution of a small business. The long hours at work and the constant pressure to perform wears out even the most passionate individuals resulting in physical & mental drain. Striking Balance between personal & professional front, managing the office, House & Children was an uphill task. My children were at an infant stage, so was my start-up business like an infant baby, both needed constant attention throughout. Managing both fronts without letting anything fall apart had been challenging. At personal front I used to be preoccupied with my children’s safety & security when I use to be away from home, upbringing them with highest conduct & values in life, their health & academic responsibility. In business, it has always been challenging to manage the high pressure, competition, maintaining quality, market uncertainty, service commitment, completing the target, late work hours schedule. It was a conscious decision to go beyond housewife life & explore entrepreneurship journey, so the hardships at Personal & Professional front have been an integral part of the whole process, which I gladly accepted without complaining. As children grew up, business also grew up. Each passing day I had to learn & unlearn, this helped me to evolve as a person enriching my experience in handling & balancing Family & Office better with each passing day. Building a team – No doubt it took some time, Planning & delegation of work, getting systems automated, developing the Process & Systems. Very Important was DECLUTTERING the unwanted & unproductive things across & creating more room for new productive things to enter. At the entry point we believe in Hiring Character with Values. We can train people on skills but cannot make someone’s value & ethic fit in organization. No compromise on ethics & values. Dominant ambitious aspiration with Belief in yourself, your dreams, your strength & ability. Perseverance & Resilience – The path of ambitious journey will have failures, obstacles, distractions & stumbling blocks which you will have to deal with resilience. Resilience enables you to live a life that is based on choice. Remember to persist & to develop the courage with hard work to move on from adversity & life challenges even when everyone around, discourages you. Be Honest to yourself, admit when you don’t know the subject matter, ask for advice & help from your mentor. Lead a journey which travels through endless learning while Accepting & Anticipating Change with Adaptability & Flexibility. Need to religiously go for Meditation, it is must for me. Nothing to regret for the past life, it has been all wonderful great journeys throughout, learning in Life beyond failure & success. It has been living with learning.